ARTBA President Pete Ruane and AASHTO Executive Director Bud Wright March 16 urged attendees at the National Conference on Work Zone Safety to contact their members of Congress and motivate them to find a permanent funding solution for the Highway Trust Fund. 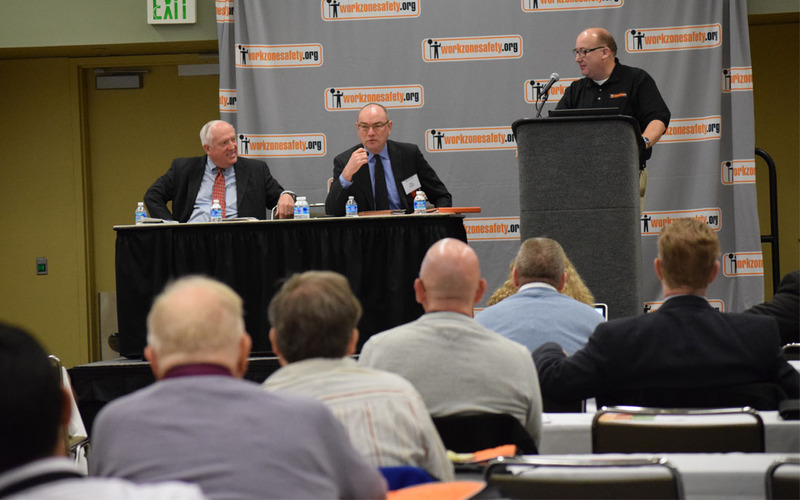 The conference was held in conjunction with World of Asphalt at the Baltimore Convention Center. “We’re looking at a dramatic problem in a few days, less than 40 working days in fact, before Congress needs to find funding reauthorization. It is imperative to communicate to get members of Congress to do their jobs,” Ruane said. Ruane quoted former Baltimore Oriole “Wee” Willie Keeler – who played for the team in the 1890s. “Keep your eye clear, and hit ’em where they ain’t,” Ruane said was Keeler’s motto, but told attendees to “hit ‘em where they are – which is at home in your congressional districts over the next few weeks.” Members of Congress will have three breaks between now and the end of May when funding authorization for the federal highway and transit program ends, Ruane noted. “Our nation is at a crossroads. Without federal investment our system falls apart. We’re trying to bring that message home in every state with every member of Congress. And it’s important to have that conversation when they are in their districts,” Wright said. “Members of Congress were elected to make tough decisions and this is a tough decision, but the good ones will take the heat,” Ruane added. “You need to tell them how important it is to get these projects funded and how you can’t achieve your goals without resources,” he said. Ruane also highlighted last week’s rollout of “Getting Beyond Gridlock,” which is ARTBA’s proposal to end the political impasse over how to fund future federal investments in highway, bridge and transit capital projects. The plan marries a 15 cents-per-gallon increase in the federal gas and diesel motor fuels tax with a 100 percent offsetting federal tax rebate for middle and lower income Americans for six years. It would fund a $401 billion, six-year highway and mass transit capital investment program and provide sustainable, user-based funds to support it for at least the next 10 years. While politicians have remained wary of any fuel tax increase as a “burden on constituents,” Wright noted that taxpayers are already carrying that burden by not investing. “The benefits of any investment far outweigh the burden that is already there. They’re going to get back in terms of not having to incur property damage from potholes, not getting seriously injured on their way to work. It’s an investment not an expenditure,” Wright said. He noted the National Work Zone Safety Information Clearinghouse, which sponsored the conference, responds to 200,000 inquiries every year. “It is a knowledge resource throughout the entire world,” Ruane said. ARTBA’s Transportation Development Foundation manages Clearinghouse operations. The facility has a vast library of services available at www.workzonesafety.org to help reduce motorist and worker fatalities and injuries on road construction sites. Wright noted the partnership between AASHTO and ARTBA and the reason conference attendees were in Baltimore: demonstrating their commitment to improving safety on America’s highways.